Note: This ammo is loaded in either Philippines or the USA at Armscor's discretion. At this time you may receive either the import version or the USA made version. If you must get USA made ammo, we recommend you buy one of the known domestic brands like Remington or Federal. 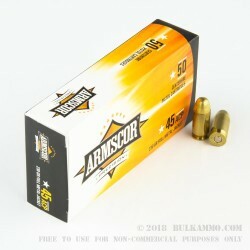 Keep your .45 ACP firearm well fed with these Armscor cartridges, available here in an economical 1,000-round case. Armscor produces this .45 Auto ammo to SAAMI specifications and uses a typical 230 grain full metal jacket bullet loaded to produce a muzzle velocity of 830 feet per second. 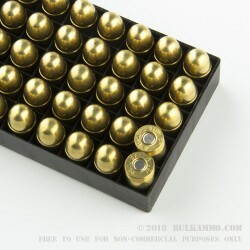 Each cartridge uses 50 Boxer-primed reloadable brass cases. The Arms Corporation of the Philippines (Armscor) produces firearms and ammunition in the Philippine capital, Manila. The company’s 1911s, chambered in .45 ACP and .38 Super, are marketed in the US under the RIA, Auto Ordnance, and Charles Daly brands and have gained considerable popularity among fans of the platform. Armscor exports ammunition to the US in large quantities and also fulfills contracts with the Philippine Armed Forces. I recently purchased 1000 rounds of Armscor 230 grain in .45 ACP. I have already fired 200 rounds without an issue. No mis-feeds and no mis - fires. Have fired quite a few rounds with no ftf's. 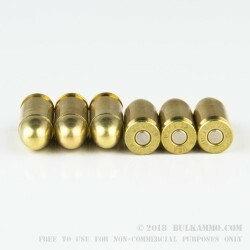 For practice, this ammo really can't be beat, especially for the price. Q: Are the primers lead free? A: Hello Antonio, This ammunition is loaded with standard boxer primers and are not considered to be non-toxic. A: Good Evening! The Armscor ammunition does feature a reloadable brass case. Q: THIS AMMO IS MFG. IN THE U.S., CORRECT? A: Hello, These 230gr. FMJ rounds by Armscor in .45 ACP are manufactured in Mexico. They are excellent rounds and you shouldn't have any problems with them. Q: Does this ammo use large or small primers? 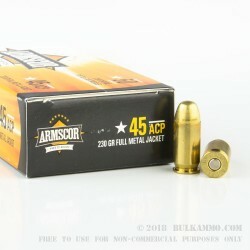 A: This Armscor 45 ACP ammo uses large pistol primers.